At the age of a hundred and eleven, Harry Patch (17 June 1898 to 25 July 2009), the last surviving soldier from World War One, gave strict instructions for his funeral: “There should be no weapons on display”. On one last visit to Flanders “to remember his pals” Harry had said that war was “calculated slaughter”, that the dead were “victims of governments” and that the “war wasn’t worth one life”. Then, with slow, telling movements of his spindly arms and his pallid, blue-veined hands, he’d carefully indicate the wreaths which he’d brought with him, that were also to be laid beside the graves of the ‘enemies’ whom the British army had killed. The last living witness to ‘the war to end all wars’ stoutly declared that he’d no time for “thieving politicians’ lies”. ‘Dulce et decorum est…’ Harry would doggedly nail the warmonger’s vampire fib, giving the vainglory of “dying for your country” an even more derisive snort than Wilfred Owen had managed. For the last soldier in that so mawkishly mythologized ‘war to end all wars’ had run counter to the whole venture by making a solemn vow never to kill a single enemy, for he “had none”. The last hero would undermine war’s hollow heroism with every breath he took, dismising the fairy stories about how noble it was for a fresh-faced boy to flush his life down a muddy toilet of a trench while screeching and bleeding and howling with horror as he was thwacked again and again by flying lumps of burning metal so that – as all the opportunistic liars and the well-respected stately madmen would so routinely claim – “others might be free”. And there was more to Harry’s thoughts than all the soft platitudes of peace and love. They were born of the bone. When faced, at Paschendaele, with someone coming towards him, coming to kill him, coming shrieking out of the smoke and cawdite with their bayonet drawn and their pistol blazing – Harry made a point of bringing them down with just a leg-wound. “I didn’t kill him” he’d say with pride and, then almost inaudibly, he would detail how, early on in the war, he’d made his own small bid to end it; to end that “war to end all wars” – a phrase at which he’d snort with the gentlest hint of sarcasm. According to King’s Regulations his peacenik pact would have been a capital offense had Harry and his mates been discovered and, ever afterwards, Harry would allude to their conspiracy with a guarded chuckle as if he could still be arrested for it, escorted to the guard-house and even put before a firing squad and shot for his ‘treason’ nearly a century on. Just after the illegal invasion of Iraq, a real traitor, the then prime minister, Tony Blair, hoped to meet Harry – now becoming quite well-known as ‘The Last Tommy’ – with a view to Blair’s exploiting him in a photo opportunity to upgrade Blair’s own profile. After Blair had effected his introduction, he edged towards Harry’s wheelchair, transparently trying to absorb Harry’s stardust and to claim it for his own. But, unexpectedly, he’d meet with Harry’s sharp rebuff. Harry regaled him with the Harry Patch remedy for conflict resolution, namely that “politicians who took us to war should have been given the guns and told to settle their differences themselves, instead of organizing nothing better than legalized mass murder”. Harry Patch had done what no War Crimes Tribunal has yet succeeded in, namely to make the despised war criminal and profiteer, Anthony Charles Lynton Blair squirm, to make his excuses and then to scuttle off. Harry also thought that Poppy Day, the nation’s commemoration beside the Cenotaph of its wartime dead, was “just show business”. Instead Harry would prefer to sit quietly with a glass of stout; a red tartan blanket on his knee; and recall each of the exact days upon which all of his good friends had died. In his mind’s eye he’d see them still, standing and quivering and then flailing “like windmills” as they stumbled and fell towards Harry through the mists of time. “They’re still thrashing about,” he’d say with a slow dab at his cheek, and then he’d gasp a second, recalling the trench dogs that tore at dead men’s battle-dress, fighting each other for the abandoned ration of a broken, bloodstained biscuit in a battle-dress pocket. Those who came as pilgrims to visit the great man from the un-great war in his care home in Somerset would meet an amateur historian, keen on Arthurian myths, who’d spent his life as a professional plumber. An “ordinary man”, Harry was keen to make that plain, but one who’d plumbed a simple truth in an extraordinary fashion. Harry had had the chance, like few others, to put war’s inflated myths to the test and find them wanting – caused by a fault-line in the human psyche which Harry had tried to patch. By way of reward, Harry would suddenly discover that he’d lived far longer than almost anyone just, perhaps, by his talking life-enhancing sense. Then one rainy Saturday in Somerset he closed his eyes, for that distant reassuring twinkle to find another home. Seated in his armchair he slipped off, with no showbiz fanfare – no medal for a final leap “over the top” to no-man’s land. To a new no-man’s land that he hoped would be unburdened by quaking, shrieking half-children and hellish bombs and searing bullets but instead filled with rollicking mates – the fellow pact members he’d kept faith with all his life – now maybe joking with all their so-called enemies that they’d spared by just winging, now perhaps a small chorus of flightless angels singing Harry’s praises. The pact’s members, and those whose lives they’d saved, was joined by someone who’d spent 111 years as a testament to the merit of none of it happening again, if he could help it. As soon as Harry’s death was announced every statesman, politician, royal panjandrum and military brass-hat sidled into the limelight, eager to use him for their own ends. Each in turn would ignorantly romanticize Harry’s courage in war, “What a man!” “What a testimony to human endeavour!” Cliché after cliché was piled on top of his body as thoughtlessly as a child slaps down mud-pies. “Private Harry Patch was the greatest living Englishman…” “We’re here to pay homage to Harry Patch, the last glorious survivor of the Great War etc” All repeated with the grandiose pride that only conceited nationalism can conjure, while each speaker pointedly overlooked Harry’s most subversive quality – each one studiedly buried his true message in the cold clay, along with his remains. Each one forgot to mention what it was that Harry Patch had actually done. 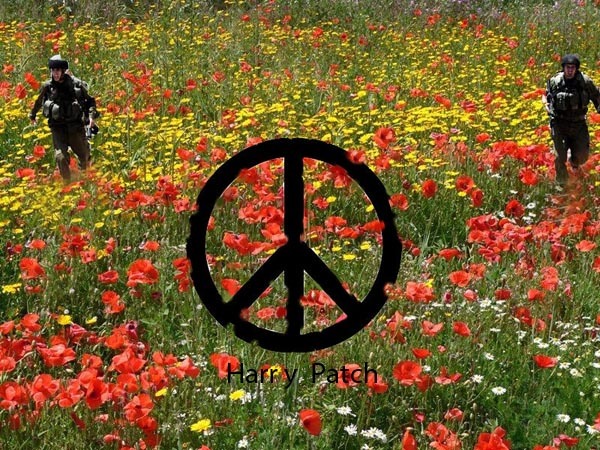 Instead they all insidiously implied that, while peace was a hopeless pipe-dream – the scorned province of cowardly simpletons – war must be good since, all said and done, had not war spawned such splendid superheroes as Private Harry Patch? Yet the irony – the unique, exquisite irony – was that the hero whom they were at such pains to appropriate to themselves, Harry Patch, hadn’t really fought in their war at all. Their hero was a fifth columnist. A ‘conchie’. A peacenik renegade. He’d never killed a soul. He’d never fought in the Imperialist war that they so sentimentalized – that war engendered solely by trade rivalry, that ‘war to end all wars’ which would then be the cause of World War Two, and then, thanks to all of that war’s unfinished business, of World War Three, the Cold War; leading inexorably to Four and maybe Five and maybe more and more and more. But instead Harry had fought against war’s oppressive, squalid lies in the bravest way he knew, together with his pals and in doing so he was as brave as any puffed-up killer. Harry had had his groin ravaged and his chest clawed at by piping hot pieces of shrapnel and he wanted others to be spared the experience of grasping hold of your burning, bleeding, disintegrating crutch while bawling across a dank, wasteland of sludge and cold, stinking shite that stretched to the horizon with no one within earshot – Spared shredded bowels and bits of flesh draped on barbed wire or frozen on the ground, and spared the sounds of misled boys screaming for their mothers before they just despaired and died. And, at the last, he fought not to have his shy, noble stature poached by crooked Whitehall kingpins – the spin doctors of the status quo, or by the dusty panoply of Royal confectionary, all of whom, through moral bankruptcy and idle self-regard, still give credence to yet more idiotic ventures whereby other lions are led by donkeys to their doom. This entry was posted on 2 August, 2012 in homepage, Uncategorized and tagged Claire Palmer, Dulce et Decorum Est, Flanders, Harry Patch, Heathcote Williams, nick victor, Paschendaele, the War to End All Wars, Tony Blair, World War 1. Bookmark the permalink. This does seem appropriate here. Red-tabbed officers of the General Staff click about in their high polished boots across the equally polished floor of the ancient château. They pass memos from one-to-another nodding their heads over them and exchanging significant looks. At the head of a long table stands the Commander-in-Chief. He stares with gimlet eyes at the map which covers the whole table top and points with his swagger-stick at a particular area. ‘This is where we’ll send the Norfolk and Sussex in,’ he says to a Lieutenant-General who stands at his side. The aide clicks over to the door and exits the room to return a moment or two later with a middle aged General, who walks up to the table and stands waiting for the CIC to speak. ‘Good morning, Wilson,’ says the CIC breezily. ‘Good morning, sir.’ Although the General carries himself with the expected military bearing, there is a certain deference in his tone. The General looks several degrees more serious as the CIC explains the strategy and points to several locations on the map. The General has gone very white; his eyes flicker across the map and he begins to comprehend the consequences of this action. He swallows and gives a nervous cough. Now the General looks even whiter. ‘But they’ll be wiped out too,’ he says. That’s over two thousand men I’ll be sending to a certain death.’ Now there is panic in his eyes. ‘I can’t just…’ He comes to a halt. ‘Yes, sir,’ says the General weakly. He seems to have lost all his gravitas as he walks away through the silence; an aid opens the door for him and he is gone. The CIC looks at his aide-de-camp and raises his eyebrows. The aide risks the hint of a smile. ‘Service Corps, sir? Or maybe Catering?’ He smirks. The CIC turns to the Lieutenant General. ‘I’ll leave you to handle that, George. Probably best to send him home.’ Then… ‘Send in General Hoog.’ he barks. General Hoog is a brisk man and there is no nonsense about his moustache. His hawk-eye takes in the room at a glance, and he stands like an alert gun dog before the CIC. ‘Ah, Hoog,’ says the CIC. ‘There’s a job for you here. Come and look at this.’ They bend over the map while Hoog is given the gist of it. ‘I see, I see,’ says Hoog enthusiastically. ‘Brilliant piece of staff-work I must say. Of course the Norfolk and Sussex won’t come out of it, but I might get some of the Wiltshires back.’ He looks hopeful.